1647 The English army seizes King Charles I as a hostage. 1674 Horse racing is prohibited in the state of Massachusetts. 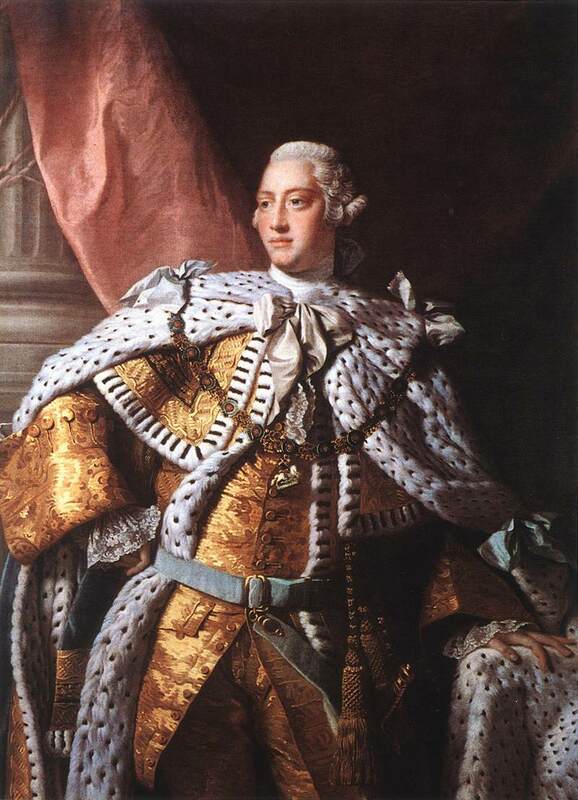 1738 Birth: King George III, King of England. "...George III is widely remembered for two things: losing the American colonies and going mad. This is far from the whole truth. George's direct responsibility for the loss of the colonies is not great. He opposed their bid for independence to the end, but he did not develop the policies (such as the Stamp Act of 1765 and the Townshend duties of 1767 on tea, paper and other products) which led to war in 1775-76 and which had the support of Parliament. These policies were largely due to the financial burdens of garrisoning and administering the vast expansion of territory brought under the British Crown in America, the costs of a series of wars with France and Spain in North America, and the loans given to the East India Company (then responsible for administering India). By the 1770s, and at a time when there was no income tax, the national debt required an annual revenue of Â£4 million to service it. The declaration of American independence on 4 July 1776, the end of the war with the surrender by British forces in 1782, and the defeat which the loss of the American colonies represented, could have threatened the Hanoverian throne. However, George's strong defence of what he saw as the national interest and the prospect of long war with revolutionary France made him, if anything, more popular than before. The American war, its political aftermath and family anxieties placed great strain on George in the 1780s. After serious bouts of illness in 1788-89 and again in 1801, George became permanently deranged in 1810. He was mentally unfit to rule..."
1783 Etienne and Joseph Montgolfier make the first public demonstration of a hot-air balloon. 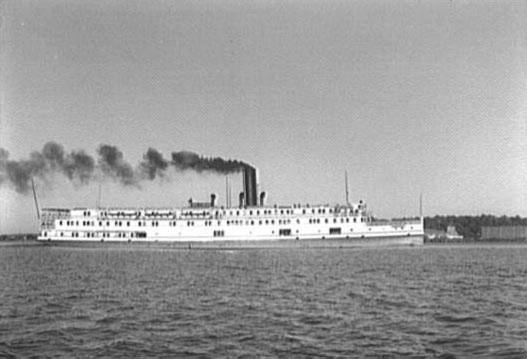 1816 The Washington, the first stately double-decker steamboat, is launched at Wheeling, West Virginia. 1831 The Belgium Congress proclaims Prince Leopold of Saxe-Coburg as the first monarch of an independent Belgium. 1859 The French defeat the Austrians at the Battle of Magenta, Italy. 1878 Turkey turns Cyprus over to the British. 1896 Henry Ford wheels his first car from a brick shed in Detroit, Michigan and drives it around the darkened streets on a trial run. 1900 French artist Auguste Rodin's sculpture The Kiss is first exhibited publicly in Paris. 1910 Death: William Sidney Porter, known as O. Henry, writer. 1912 Massachusetts passes the first US minimum wage law. 1916 WW1: The Austrian spring offensive against Italy brings yet another appeal to Czar Nicholas for help. General Aleksei A. Brusilov, the commander of the Russian Southwestern Army Group, attacks along a 300 mile-long front. Well-planned and well executed, The Brusilov Offensive devastates the Austro-German line in two places and drives forward. 1917 The very first Pulitzer Prizes are awarded; Laura E. Richards and Maude H. Elliott, along with their assistant, Florence Hall, receive the first Pulitzer Prize for a biography, Julia Ward Howe. With Americans of Past and Present Days, by Jean Jules Jusserand, receives the first prize for history, while Herbert B. Swope of the New York World picks up the first reporter's Pulitzer. 1918 WW1: Ludendorff calls off the offensive after heavy losses. The American Second Division then counterattacks, spearheaded by its Marine Brigade. 1920 Hungary signs the Treaty of Trainon at Versailles, reducing the country in area from 109,000 sq. miles to less than 36,000 sq. miles. 1920 Birth: Russell Train, environmentalist. 1924 In memory of all the soldiers from the state of New York who died in WW1, an eternal light is dedicated at Madison Square in New York City. 1931 The first rocket-glider flight is made by William Swan in Atlantic City, New Jersey. 1935 Pierre Laval forms a new French cabinet. 1936 Leon Blum becomes the first socialist and the first Jew to serve as premier of France. Presiding over the Popular Front coalition of Socialists, Communists, and liberals, he responds to worker unrest with reforms such as paid vacations, collective bargaining, and the 40-hour work week. 1937 The first ever shopping carts trundle down the aisles of a Standard Supermarket chain store in Oklahoma. Sylvan Goldman, the chains owner, has created this consumer-friendly innovation by fixing baskets and wheels to children's chairs. 1937 Birth: Robert Fulghum, author. 1939 Holocaust: The SS St. Louis, carrying more than 900 Jewish refugees from Germany, is turned away from the Florida coast. 1940 WW2: The Allies begin evacuating their troops in Norway. 1940 WW2: Facing disaster on all fronts, British Prime Minister Winston Churchill delivers his famous "We shall fight on the beaches ... we shall never surrender" speech to the House of Commons. "...The enemy attacked on all sides with great strength and fierceness, and their main power, the power of their far more numerous Air Force, was thrown into the battle or else concentrated upon Dunkirk and the beaches. Pressing in upon the narrow exit, both from the east and from the west, the enemy began to fire with cannon upon the beaches by which alone the shipping could approach or depart. They sowed magnetic mines in the channels and seas; they sent repeated waves of hostile aircraft, sometimes more than a hundred strong in one formation, to cast their bombs upon the single pier that remained, and upon the sand dunes upon which the troops had their eyes for shelter. Their U-boats, one of which was sunk, and their motor launches took their toll of the vast traffic which now began. For four or five days an intense struggle reigned. All their armored divisions-or what Was left of them-together with great masses of infantry and artillery, hurled themselves in vain upon the ever-narrowing, ever-contracting appendix within which the British and French Armies fought. Meanwhile, the Royal Navy, with the willing help of countless merchant seamen, strained every nerve to embark the British and Allied troops; 220 light warships and 650 other vessels were engaged. They had to operate upon the difficult coast, often in adverse weather, under an almost ceaseless hail of bombs and an increasing concentration of artillery fire. Nor were the seas, as I have said, themselves free from mines and torpedoes. It was in conditions such as these that our men carried on, with little or no rest, for days and nights on end, making trip after trip across the dangerous waters, bringing with them always men whom they had rescued. The numbers they have brought back are the measure of their devotion and their courage. The hospital ships, which brought off many thousands of British and French wounded, being so plainly marked were a special target for Nazi bombs; but the men and women on board them never faltered in their duty..."
1941 Holocaust: The Nazis execute 24 Polish professors in Lwow. 1942 Death: Reinhard Heydrich. "...Despite Himmler sending his best doctors, Heydrich died in agony in a Prague hospital at 4:30 a.m. on June 4 at the age of 38. Although the exact cause of death has not been definitively established, the autopsy states that Heydrich's death was most likely septicemia caused by bacteria and toxins from grenade splinters. A highly elaborate funeral was staged for him in Berlin, with Hitler attending (and placing on Heydrich's funeral pillow displaying his decorations the highest grade of the German Order and the Blood Order Medal). Hitler himself perhaps best encapsulated Heydrich's general attitude in his acknowledgment that Heydrich was partly to blame for his own death through arrogance and a blasÃ© attitude: "Since it is opportunity which makes not only the thief but also the assassin, such heroic gestures as driving in an open, unarmoured vehicle or walking about the streets unguarded are just damned stupidity, which serves the Fatherland not one whit. That a man as irreplaceable as Heydrich should expose himself to unnecessary danger, I can only condemn as stupid and idiotic." Lina Heydrich later stated that she believed Heydrich had expected a young death, saying that she saw his frequent unnecessary risk-taking (such as his valiant adventures in his Luftwaffe Me 109) as an attempt to ensure that, should he die, his would be a dramatic death..."
1942 WW2: June 4-7 The Battle of Midway. "...A battle scheme was set up by Yamamoto and his staff. The entire force of the Combined Fleet would be sent across the Pacific to give battle to the US Pacific Fleet in the waters around Midway. For that goal, Yamamoto's order of battle included most every fighting unit that was not needed in tasks around the Empire. Among the fleets were seven battleships, ten carriers, two dozen cruisers, and more than seventy destroyers, dispersed among half a dozen fleets. Admiral Yamamoto would lead the impressive Main Body, battleships Yamato, Nagato and Mutsu, the Imperial Japanese Navy most powerful battleships. Support would come from the light carrier Hosho, and its eight attack planes, they would be used for anti-submarine work. Destroyers would screen the powerful First Air Fleet under command of Vice-Admiral Nagumo Chuichi. For the mission, all six of the heavy carriers would be available according to the plan. Two battleships and two heavy cruisers plus a destroyer squadron would be forming the protective circle around the carriers. This great assembly of naval units would be used in deploying the Japanese plan....On the Island of Midway at 0230 pilots and air crews were awakened and just fifteen minutes later the units of the First Air Fleet, in preparations for the air attacks that morning against Midway began at 0245 when pilots and air crews aboard the flagship, Akagi, were awakened. At 0400 PBY Catalinas and F4F Wildcats from Midway had already taken off, patrolling the area and the island. By 0430, the first airplanes started lifting off for their first air strike of the day, 108 planes from all four carriers this time. Half an hour earlier, Scouts were launched from the Japanese carriers prior to the attack, but too few: one Kate each from Akagi and Kaga, supplemented only by two catapult planes from Tone and two from Chikuma, and a smaller scout from Haruna. Tone's No.4 catapult plane would not launch in time due to a malfunction and Admiral Nagumo did not send out a replacement as he could have should done. The strike force, closed on Midway, and appeared shortly before 0600 on the radar at Midway. Midway's base commander launched all available planes, including the twenty-seven fighters led by Marine Major Floyd B. "Red" Parks, which would jump the enemy bombers on their run in. Six Avenger torpedo-bombers, four Army Marauder medium bombers, eleven Marine Vindicator dive-bombers and sixteen Douglas Dauntlesses, and a total of nineteen B-17 bombers, augmented the rest of the 32 total Catalinaâ€™s. Major Park's pilots and their planes in both numbers and quality were not ready to engage this enemy..."
1943 President Ramon Castillo is overthrown by an army coup in Argentina. 1944 WW2: Rome is liberated by allied troops (US 9th Army) with the US General Mark Clark leading the way into the city. 1944 WW2: U-505 becomes the first submarine captured and boarded on the high seas. 1946 Nuremberg War Crimes Trials: Wehrmacht General Alfred Jodl defends his role in the infamous 'Commando Order.' "...the Fuehrer...turned to Field Marshal Keitel and to me and demanded an executive order...he added: "But I do not want any military courts. "...I had very many doubts which a careful study of the Hague rules of warfare could not dispel. My wish was an entirely different one. It was my intention to avoid an order altogether...Then on 17 October General Schmundt, the Chief Adjutant of the Fuehrer, came to me and said that the Fuehrer was demanding an executive order. I gave him the following answer, word for word: "Please give him my best regards, but I will not issue an order like that." Schmundt laughed and said, "Well, I cannot tell him that," and my reply was, "Very well, then, tell the Fuehrer that I do not see how a decree like that could be justified under international law." And with that he left. I hoped now that I would be asked to come to the Fuehrer, so that at last, after many months, I should again be able to speak to him personally....I wanted an opportunity either of telling him my misgivings or else being thrown out altogether. Either eventuality would have helped me but neither occurred. A few minutes later Schmundt called me on the telephone and informed me that the Fuehrer was going to draw up the orders himself. On 18 October Schmundt again came in person and brought with him these two orders of the Fuehrer-the order to the troops, and an explanation for the commanders...there is the proposal which the foreign division of the intelligence department made: "Members of terrorist and sabotage troops who are found.. . without uniform, or in German uniform, will be treated as bandits. . . or if they fall into German hands outside battle operations, they are to be taken at once to an officer for interrogation. Thereafter they are to be dealt with by summary court martial." That was quite impossible, for if one came across a soldier in civilian clothing, without uniform, no one could know just who he was. He might be a spy or an escaped prisoner of war or an enemy airman who had saved his life by jumping from his plane and now hoped to escape in civilian clothing. That had to be determined by an experienced interrogating officer and not by a summary court martial consisting of a lieutenant, two noncommissioned officers, and two soldiers...The theory was that soldiers, who by, their actions put themselves outside the laws of war, cannot claim to be treated in accordance with the laws of war. This is a basic principle definitely recognized in international law, for instance in the case of a spy or a franc-tireur. The aim of this order was to intimidate British Commando troops who were using such methods of warfare. But the order of the Fuehrer went further and said that all Commando troops were to be massacred. This was the point on which I had grave misgivings..."
1946 General Juan Peron is inaugurated as president of Argentina. 1947 The House of Representatives overwhelmingly approves the Taft-Hartley Act. 1954 French Premier Joseph Laniel and Vietnamese Premier Buu Loc initial treaties in Paris according independence to Vietnam. 1956 The secret speech by Khrushchev in which he blasted Stalin, is made public. 1972 Angela Yvonne Davis, a black militant, former philosophy professor at the University of California, and self-proclaimed communist, is acquitted on charges of conspiracy, murder, and kidnapping by an all-white jury in San Jose, California. In October 1970, Davis was arrested in New York City in connection with a shootout that occurred on August 7 in a San Raphael, California, courtroom. She was accused of supplying weapons to Jonathan Jackson, who burst into the courtroom in a bid to free inmates on trial there and take hostages whom he hoped to exchange for his brother George, a black radical imprisoned at San Quentin Prison. In the subsequent shoot-out with police, Jonathan Jackson was killed along with Superior Court Judge Harold Haley and two inmates. Davis, who had championed the cause of black prisoners and was friends with George Jackson, was indicted in the crime but went into hiding. One of the Federal Bureau of Investigation's most wanted criminals, she was apprehended only two months later. Her trial began in March 1972 and drew international attention because of the weakness of the prosecution's case and obvious political nature of the proceedings. In this day in 1972, she is acquitted of all charges. She will return to teaching and writing and in 1980 will be the vice-presidential candidate of the US Communist Party. In 1991, she will become a professor in the field of 'the history of consciousness' at the University of California at Santa Cruz. Four years later, she will be appointed a presidential chair at the university amid controversy about her communist and black militant background. Her writings include Angela Davis: An Autobiography and Women, Race, and Class. 1975 The Rolling Stones become the first rock band to receive royalties for sales of their records in Russia. 1977 The Soviet Union publishes its new draft constitution, which will be approved by the Supreme Soviet the following October. 1982 Israel attacks targets in southern Lebanon. 1985 The US Supreme Court strikes down an Alabama minute-of-silence law as specifically fostering classroom prayer. 1986 Jonathan Jay Pollard, a former Navy intelligence analyst, pleads guilty in Washington to spying for Israel. He is still serving his life prison term. 1989 Tiananmen Square: Democracy takes a hard blow this day in Peking as the People's Army of China opens fire on crowds of demonstrators. What began as a student demonstration on behalf of democracy a month and a half earlier, has become a demonstration of hundreds of thousands of people from all walks of life defying the government ban on the students' action. Armored tanks of the People's Army literally roll over demonstrators as the world watches tragedy unfold on live TV. 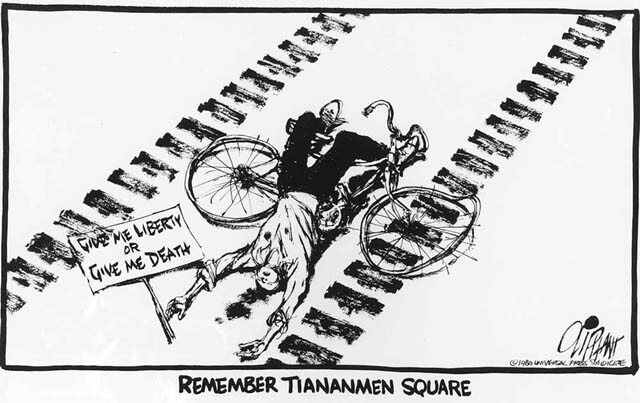 The government issues statements claiming that only a few have died, but other estimates of the deaths in Tiananmen Square range from hundreds to several thousand. Thousands of demonstrators are later jailed. 1989 Gas from a leaking pipeline explodes, engulfing two packed passenger trains on the Trans-Siberian railway; 575 people are killed and more than 600 injured in the second worst rail disaster ever. 1990 An Oregon woman, Janet Adkins, kills herself in Michigan using a 'suicide machine' developed by Jack Kevorkian, whom the media has labeled 'Dr. Death.' She is the retired pathologist's first 'medicide' patient, but will not be the last. 1990 Soviet President Mikhail Gorbachev ends his US visit in northern California, where he meets with former President Ronald Reagan and South Korean President Roh Tae-woo and addresses students at Stanford University. 1991 After a 20-day general strike, the communist government in Albania under Fatos Nano resigns, ending 46 years of Communist rule. 1994 Iran-Contra figure Oliver North wins the nomination of the Virginia Republican Party for the US Senate. 1996 Europe's Ariane-5 rocket is blown up by ground controllers after it veers off course 40 seconds into its maiden flight. 1998 A federal judge sentences Terry Nichols to life in prison without the possibility of parole for his role in the Oklahoma City bombing. 1998 The five major nuclear powers (the United States, Russia, China, France and Great Britain) renew their appeal for India and Pakistan to stop development of nuclear arms and offer to help the two antagonists resolve their conflict over the Kashmir region. 1999 On the 10th anniversary of China's crackdown on the Tiananmen Square protests, tens of thousands of people in Hong Kong hold a candlelight vigil. 1999 The Yugoslav government approves a plan, proposed by Finland and Russia and supported by the major Western nations, which would end NATO's bombing campaign against Yugoslavia. 2000 Two days of meetings between US President Clinton and Russian President Putin end with no agreement on the proposed US missile defense system. 2002 Tensions ease between India and Pakistan; the two had appeared to be on the brink of nuclear war.